We’re gearing up for the Taieri Festival of the Plain in March where we will be presenting the Plains Country Cabaret. Nick Bourke will be headlining the show, with backing provided by Shindig. Locals Merv Pulham, Brooke Pennington and Graeme Partridge will be supporting them. 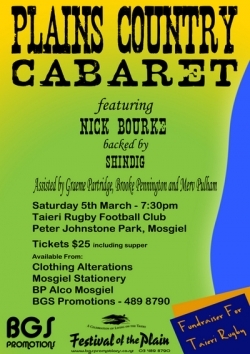 The show will be at 7:30pm on Saturday the 5th of March at the Taieri Rugby Football Club (located at Peter Johnstone Park, Mosgiel). Tickets are $25 per person and include supper. The concert is a fundraiser for the Taieri Rugby Football Club, so your support will help their club.